In their final season as a member of the Big 12, will Nebraska take out 15 years of frustration on Texas or will the Longhorns break the collective hearts of Husker Nation one last time? Click Read More for the video preview of Texas vs. Nebraska and place your vote on whom you think will win the game. This is a good example (along with the MSU/UM matchup last week) of the need for EA to address running QBs. The 'Huskers will have to lay a real egg to drop this one. 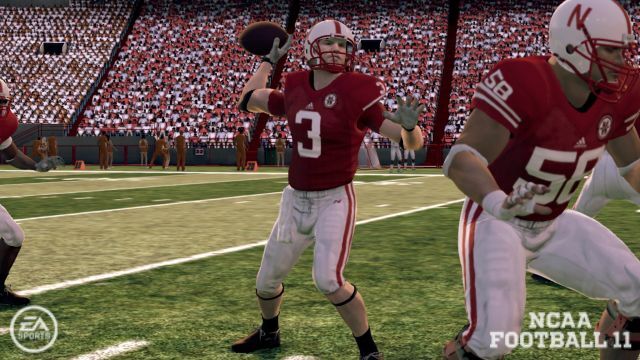 When you guys did the sim did you use the default Nebraska playbook or something that fits their current style with Taylor Martinez? With all the Husker fans on this site I think it would be a miracle if Texas got more votes. I'm honestly hesitant to believe that Nebraska will win. I want them to, and despite my historical admiration for Texas I'll be cheering for Nebraska ... but I just have this gut feeling that Texas will find a way to bottle up Taylor Martinez's running .. and I'm not sure what else Nebraska has right now. That's what I'm hoping they'll show me on the field on Saturday. After UCLA freaking shredded Texas defense I don't have a lot of faith in them stopping Nebraska's running game. And I think Nebraska's defense will destroy that offense. I can't see Nebraska losing this game. We used the default playbooks. The only change came in the form of Iron Dragon's rosters. We do have some UT fans on board - Oneback, Papa Lonestar, Marlowe, Jason_French....maybe more. Having suffered through all of the close losses, I find it hard to put NU as a definitive favorite. UT had a week off to get ready and there's some talk that OC Greg Davis will open things up more for Gilbert. I think it'll be another very close game against Texas but I hope it finally has a happy ending. last year i read that they werent going to. They do ... kinda. They don't really do much of anything on offense, so it's hard to say what they're using. I feel compelled to notify the administrators of this site that I will be taking a case to College Football Final's Final Verdict ... the blatant homerism in choosing Texas/Nebraska over Ohio State/Wisconsin ... I shall not stand for it, sirs. Texas came in with a better gameplan and executed very well. NU has a long ways to go nationally. And now, in hindsight (and it took until the 4th quarter), Ohio State / Wisconsin looks like the Game of the Week. Nebraska crapped the bed. Much like Michigan showed against Iowa, run-first spread offenses need balance against good defenses. If you can't throw the ball you will struggle. Of course a few key drops really hurt Nebraska on Saturday. Michigan's loss to Iowa was particularly disappointing because Denard looked clueless as a passer. I don't think he completed a pass more than 5 yards and was really indecisive. Tate was much better throwing the ball and almost pulled them back. Of course we needed a defensive stand which never happened. Ohio St. looked terrible in the first half against Wisconsin and they were never really able to stop their ground game. Wisconsin deserved the win. South Carolina blows a 28-10 lead and the Top 10 is crazy. Nevada losing to Hawaii will hurt Boise St. some more but Boise should have a spot in the Top Two now. Nevada losing to Hawaii will hurt Boise St. some more but Boise should have a spot in the Top Two now. Combine that with Oregon State's loss to Washington and Boise playing San Jose St, and their strength of schedule took a pounding yesterday. Nevada's loss shouldn't drop them far ... I say shouldn't in the idealistic view of the way the world should work, not the way it actually does. Hawaii has been playing some teams very close at their place this year, and Nevada had a shot late. But, of course, since they're Nevada and no longer undefeated, they'll drop like a rock.